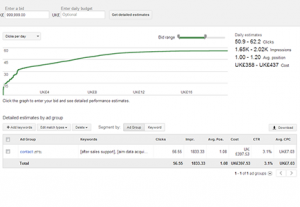 Is the Keyword Planner Google’s Latest Moneyspinner? Home » SEO » Is The Keyword Planner Google’s Latest Moneyspinner? I read this article and found it very interesting, thought it might be something for you. The article is called Is The Keyword Planner Google’s Latest Moneyspinner? and is located at https://www.ben-johnston.co.uk/keyword-planner-api/. As you probably know, Google killed off their popular AdWords keyword tool the other week. It’s been the backbone of millions of SEO and PPC keyword research campaigns over the years and, although I can’t remember the last time I logged into it, the API fed data to a number of my preferred tools. This change is not for the better. My favourite “base” keyword research tool, Market Samurai (aff), is still absolutely brilliant, but, where exports used to give you search volumes and traffic estimations on broad, phrase and exact matches, due to the way the Keyword Planner works, it’s now only giving exact match results. The tool is still very handy, but due to the way my keyword research process works, it’s less useful as I like to examine all the variables. Essentially, this new version of Google’s keyword tool is cutting the effectiveness of my research down, and I, like many other SEO’s, am not overly happy about it. But what if that’s what Google want? For all the SEO industry’s paranoia around Google trying to kill us off and get us to move all our clients onto AdWords (the “Not Provided” situation, anyone? ), I think that deep down, we know that’s not the case. Google got to where it is based on serving the best organic results of any search engine. I don’t think for a second that they wouldn’t rather we were all using AdWords so they could get paid, nor do I think that they’re not going to take umbrage to people gaming their algorithm, but the argument can be made that good SEO is now so integral to Google serving solid organic results that they know it’s not going anywhere. But good SEO doesn’t directly make Google any money, does it? Google is an advertising and media company. They have money to make and shareholders to appease, and who can really blame them? If I’d built the world’s largest search engine, the world’s most popular website analytics package and other widely-used web tools like Gmail, I’d be finding ways to make money out of them too. That said, if their organic results aren’t making them money, but there’s an entire industry based around them, how do they get a cut of it? What if they put an eye on a different part of the game and monetised the parts of SEO that you really, truly need their tools for, like finding search volumes? The Keyword Planner may be free, but it’s so limited that, after it started cutting down the functionality of other tools, some people are naturally going to start looking into ways to get their data back. At least, that’s what I’ve spent a fair bit of time doing recently. 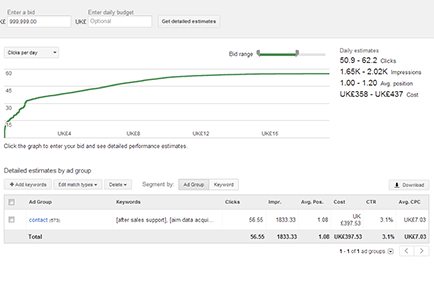 Google offer a very functional API from AdWords, and keyword volumes are part of this. A lot of tools leverage it, and they’re so dependent on it that they have changed the functionality of their product to keep ahold of the access to it. When looking into the very nifty Excel AdWords API add-in by SEOGadget, it seems that you might still be able broad and phrase match results for your keyterms, you just need to change the call made to the API through the formula. I can’t say for certain at this stage though – Google seem to be taking forever to approve my API token. I’ll update this post when I know for certain. Having looked into the costs of using the API for keyword research, it’s not exactly prohibitive. We’re talking about 25c per 1000 searches per match type, so I could check out 1000 keywords over broad, phrase and exact match for less than a pound. That kind of money’s not going to put me off, nor is it most agencies, but if you think about how many companies there are out there needing this information, the companies that are building their own tools out of the API and doing in-depth keyword research, that money’s going to add up. The odd few pounds here and there might seem like nothing, but with hundreds of companies just in the UK doing that numerous times a day, it’s going to add up. Either way, the house always wins and, ultimately, we’re playing in their house. Am I just being paranoid and feeding the Google FUD about SEO, or are you looking into other ways that you can get the keyword research data you need and paying for the privilege? Should I put the tinfoil hat down and just be thankful for what I’m given? I’d be really interested to hear your take. Comments are open (now with IntenseDebate rather than Disqus), or you can give me a shout on Twitter.